At first glance the Spiny Dogfish is an unimpressive little shark. It is barely five feet in length when fully grown and more commonly tops out at a modest three feet. However, dig a little deeper and you find out that there is more to this pint sized predator than meets the eye. It belongs to the order Squalidae which contains more than seventy species collectively referred to as dogfish sharks. Labeled Squalus acanthias by science, it has been given many common names in the past including: Blue dog, Common spinyfish, Darwen salmon, Grayfish, Pacific dogfish, Piked dogfish, Rock salmon, Spiky dog, Spotted dogfish, Spring dogfish, Spur dog, Victorian spotted dogfish, White-spotted dogfish, and Mud shark, and that’s just the English names! Although Spiny dogfish are not seen by divers in the tropics, they are exceptionally common along sub-arctic and temperate coastlines around the world. In fact, Squalus acanthias is the most common shark in the sea – at least for now. Not confined to the surface layers, it has been recorded at depths down to 900m and it may hunt even deeper. Spiny dogfish are by nature social animals that school by the thousands. Doug Biffard of Parks Canada put it well when he said: “Back in the early 80’s, there were so many of them that when they appeared ‘en masse’ they would block out the sun”. It must have been awe inspiring to look up and see a completely impenetrable wall of sharks swimming your way. Sadly, their very abundance has led to their own demise. Since the 60’s fishing efforts have been concentrating way too heavily on Spiny dogfish in both the Atlantic and Pacific Oceans. They are utilized for all manner of products including England’s famous ‘fish and chips’, shark liver oil, laboratory specimens for thousands of budding marine biologists, and perhaps even sadder; hundreds of tons of fertilizer. In the Western Atlantic between 1989 and 1996, annual catches grew from an already precarious 2,500 metric tons to an unfathomable 21,000 metric tons. By this time the species as a whole was teetering on the brink of collapse and sure enough, the following year’s yields were significantly down. Part of the reason for the Spiny dogfish’s inability to respond to over fishing lies in its incredible physiology. One fact you may want to commit to memory for your next game of Trivial Pursuit, is that our lowly Spiny dogfish has the longest gestation period (pregnancy) of any vertebrate in the world – up to two years. 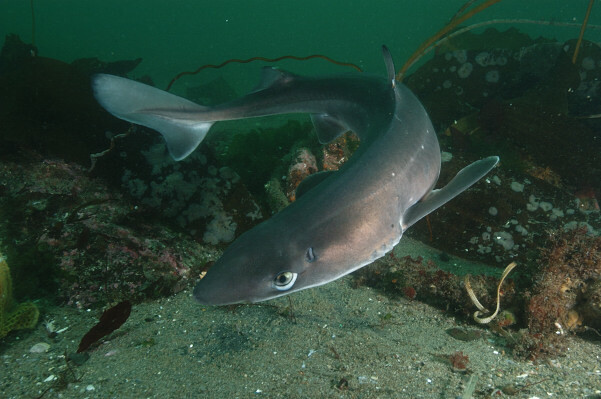 Spiny dogfish can have twenty pups but usually brood around six. Like other squaloids, they are ovoviviparous, meaning that their young develop inside thin egg cases within the mother’s uterus. Once the embryonic sharks are fully developed, the egg cases are discarded and shortly afterwards the foot long dogfish are released into the ocean. The long gestation period alone makes dogfish vulnerable to over-fishing, but the real obstacle that they face is their late maturity. Depending on the region, females mature at anywhere from 11 to 26 years of age. This means that they have to run the gauntlet each fishing season simply to survive long enough to begin the process of procreation. It is not surprising that they are struggling. Yet another problem is that some populations of Spiny dogfish seasonally migrate over vast distances. Individuals tagged in British Columbia, have shown up off the coast of Japan. An epic journey of some 7000km. This brings these populations in contact with multiple fisheries, increasing their chances of ending up on a dinner plate. It’s not just humans that eat dogfish. Their small size makes them easy targets for larger shark species, killer whales, and seals. Even Giant pacific octopuses will bag the occasional Spiny when they can get one. Fortunately, Spiny dogfish are hardy little sharks. Tagging programs and examination of the growth rings on their dorsal spines (a bit like counting tree rings) indicate that they can live up to 70 years or more. Some marine biologists believe that on rare occasions they may even reach the ripe old age of 95. Due to the diligent efforts of marine conservation groups, in the last couple of years catch quotas have finally dropped to within what many scientists consider sustainable levels. Only time will tell. It will take many generations to return the stocks to their former glory and the over fishing of smaller species that they like to eat will not help in their recovery. It’s a gloomy picture but all is not lost. Spiny Dogfish like many other species are versatile and adaptable. There is even evidence that in response to declining numbers, females may be starting to mature earlier. Given time and protection we may yet see the species rebound and perhaps in our lifetime, we will again be able to look up on a dive at an impenetrable wall of Spiny dogfish blocking out the sun.